I'm sitting here in my office and it's 2:15 p.m. I'm still in the sweats/pajamas I slept in, hair uncombed and I have only eaten a banana so far today. When Andrew Henry leaves for work in the morning I come in here and check on the blog and my shop, fill orders, answer emails, go visit your blogs then I am supposed to go get dressed etc. (according to the schedule in my mind). Some days this happens, some days it does not. I have trays of jewelry waiting to be photographed and loaded, the vintage stuff usually needs to be cleaned or tweaked and then there is the large pile of items waiting for me to fashion into some new pieces which I like to work on as well. You see why it's early afternoon and I don't know if I've brushed my teeth (isn't AH a lucky fellow?). I get lost in the jewelry. It's a good problem to have I think. Hope you enjoyed some cyber window shopping - see anything you like? Beautiful- I especially love the crystal pieces- I think as long as you brush your teeth before AH gets home you are fine! Ah the creative process - how wonderful to learn that I'm not the only one who gets caught up and a whole day can disappear! 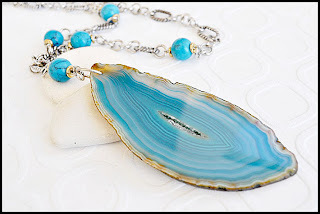 Your work is marvelous Jeanette - I especially love the turquoise piece at the beginning and the crystals. Your shop is beautiful and I love your creativity. The crystal bracelet is very sweet. Happy Tuesday, sweetie. Very fun mix of jewelry in your shop. Are those the chandelier parts earrings you were working on? They turned out great. I bought some chandy cyrstal over a year ago to try doing something like that and never got to it. Funny, I think I'll be writing this same post next year when Drew is in full day school. It's so easy to just get sucked into the jewelry :) Have a great day! It's hard to pick a favorite. What beautiful pieces. I'd love to be able to be lost in something like that. I don't find myself in my PJ's late in the day but sometimes at lunchtime I find I am still wearing the 'scruffies' I threw on first thing in the morning. I brush my teeth before my breakfast, food tastes better. On the weekends... I try to stay in my jammies as long as possible. Lovely items. If you work better in your PJ's then so be it. lucky you!!! I love pj days! Anything crystal just steasl my heart! You have such talent and an eye for treasures Jeanette! All lovely - so wonderful to have such a beautiful creative outlet!! wahahahahahahah so like me some days ! and I did see several things I liked. Loved seeing all of this .. but I'm actually headed to your shop now to see if I can find this gorgeous "Joy in the Journey neclace you make to buy for a dear friend of mine. Nice to read this post Jeanette! This totally happened to me yesterday and I don't have an Etsy shop to blame it on. I got "lost" online and before I knew it... half the day gone. You've got some really lovely pieces in your shop, lady loo!! SO funny to hear that so many of us do stay in our jammies quite a while, and others wish that we could! I have taught home school in my jammies (tee hee) to wee ones still wearing theirs-such fun. To remedy the jammy wearing, I have moved my workout to first light - but that has only severed to ensure that I am in something sweaty for the rest of the day. A trade of uniform I guess. you have some BEAUTIFUL! things! i'm like that too, half the day has gone before i realize i haven't done the basics!! lately i try to make myself do them before i get on the computer - it seems to help! Nice sampling of pieces from your shop. I know that wasn't easy to put together. They look great. Gorgeous, gorgeous, gorgeous!! I am drooling over the metal work right now. Jeanette, you are incredibly talented with such an eye for beauty. I mean that with all sincerity, your shop is a wonderful treasure trove. Any day that you are still in your pj's by afternoon is a good day in my book! I don't get nearly enough of these days any more. Those amethyst pieces are gorgeous! I love love love that top necklace. Is that a necklace? I need it! the first necklace is really pretty. tho i am not usually a purple gal. that may change since it is justin bieber's favorite color. HA! just had to throw that in there. my students love to tell me how uncool that is!